First the 2018 painting "Pres de Champ de Mars" ("Near the Champ de Mars") featured a wonderful cul de sac that ends at the foot of the Eiffel Tower. And now, just a few blocks up the Avenue de la Bourdonnais is the latest work "Bourdonnais et Rapp" featuring a typical Paris cafe/bistro located on Avenue de la Bourdonnais at the intersection with Avenue Rapp. Don't bother looking for yourself if you happened to be at the cafe that February 12th morning: all of the patrons are "made up" (except for the waiters) and tables have been moved around to suit the painting. The magnificent 1938 Delahaye 135MS Teardrop Coupe is parked in the "LIVRAISON" zone, and, like the patrons has probably never been there... but... it is at home where it belongs: in front of a cafe in Paris, France. The elegant and sensuous Figoni and Falaschi body mirrors the architecture of the cafe and the neighborhood. It just looks right. The 44x34" (110x85cm) acrylic on canvas is a major new work premiering at the 2019 Retromobile Show in Paris. A full size canvas reproduction edition is planned. "Canadian International AutoShow ICONS - Art and the Automobile 2019"
The Canadian International AutoShow with the Cobble Beach Concours d'Elegance has launched a feature of the 2019 AutoShow called "ICONS - Art and the Automobile" in which unique vehicles are presented as works of art. 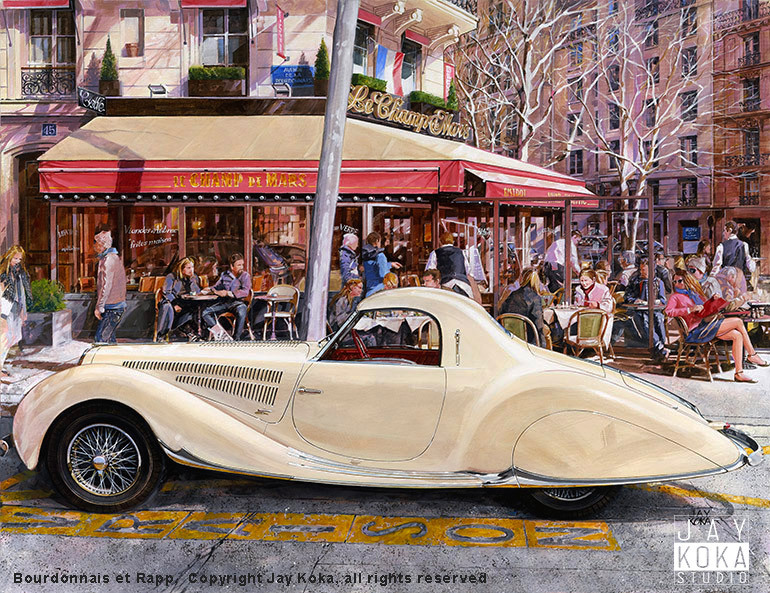 The 2019 inaugural event art features the 1937 Cadillac Series 90 Hartmann Cabriolet from the Patterson Collection. The background is the iconic Royal Alexandra Theatre in downtown Toronto. The art has been published as a fine quality poster available from the AutoShow at the event February 15 thru 24th at the Metro Toronto Convention Centre www.autoshow.ca contact the show for further information. The poster is not available from the Studio.